This set comprises two small size PCBs. A small 50mm x 20mm circuit contains the pre-amplifier and A/D converter electronics. The second PCB contains all the control electronics, Data Storage and PC interface. A choice of USB, RS232 and parallel port is available. A data storage memory of 512kbyte contains enough memory to save a large number of scans. 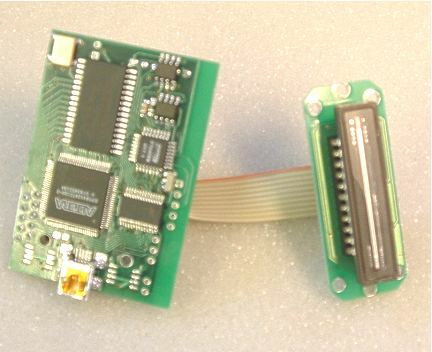 This enables high speed data acquisition. this price includes a TCD1205 or TCD1304 detector. Supplied with these circuit boards are software drivers and demonstration programs for Visual Basic, Delphi, LabView and C++. Software drivers are supplied in the form of a DLL or COM server, ActiveX. Communication to the USB and RS232 is also possible using low level ASCII string programming. Custom PID and VID can be programmed into the USB devices. Also custom device description allows the hardware to be identified using custom manufacturer's name and Product name. Please contact us if you need a detector not listed above.